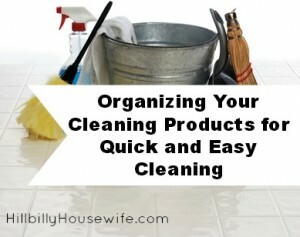 The more organized your cleaning products are, the faster you clean. This means you have more time for work and play. It can save you money too! These three simple steps will help you organize your cleaners and keep them organized. Step One: Baskets in each room. Buy or find a cleaning basket for each room. Depending on the room you might consider a plastic tote with handles, a cardboard box, a basket or a tote bag. Consider also labeling the basket so it is always returned to the correct room. Keep the totes nearby. For example, you might keep your kitchen cleaning supplies tote under your kitchen sink. You might keep you bathroom tote in your linen closet. Old buckets and milk crates work well for cleaning supplies too. You don’t have to buy new. Keep the cleaning products and the tools together. In your kitchen that might include a dry rag, a scrubber, and a toothbrush for the tile grout. When everything is kept together it’s easy to clean a room quickly. You don’t need to buy a different product for each task. For example, your kitchen surface cleaner can clean your bathroom surfaces too. Instead of buying ten different surface cleaners, you can buy in bulk. Buy extra storage containers or spray bottles. You can then use the same cleaner in different rooms without spending a fortune on packaging. Additionally, by using reusable bottles and buying in bulk, you’re reducing the amount of packaging that goes into landfills. Many natural cleaning products are available in bulk. Taking this extra step means you eliminate harmful chemicals from your home’s air. You also help improve the environment by ensuring fewer toxins enter the air, water and soil. You can absolutely buy natural cleaning products in bulk. 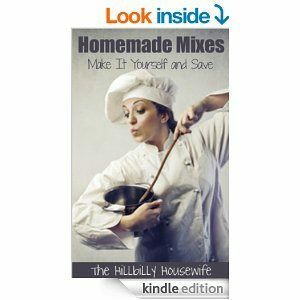 However, you can also make your own cleaning products. You can prepare them in large batches and use them in most rooms in your home. For example, a home made all purpose cleaner can be made from vinegar, borax, water, dish detergent and a few drops of your favorite essential oil. If you’re making your own cleaners or buying in bulk and using additional spray bottles be sure to label each bottle. You can use a simple sharpie marker or a label maker – the choice is yours. Organizing your cleaners takes just a few minutes and it’ll save time each time you clean. It also helps family members take responsibility for some of the cleaning. And buying in bulk or making your own saves money too. Grab a few totes, buy in bulk, simplify and label. It’s that easy!